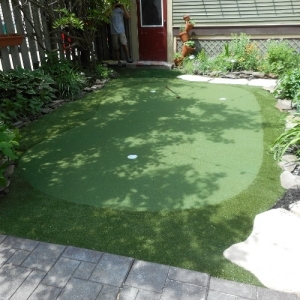 Bring the fun and challenge of the short game home with a Backyard Putting Greens Do It Yourself kit from Custom Turf Outlet. Order Your DIY Backyard Putting Green Kit Today! For those that enjoy a brief distraction to help their creative process or professionals that wish to spend more time in practice and less time getting to the greens, these well-designed kits take mere moments to set up and require little upkeep. Topped with Northeast Bat Grass cross stitched nylon, these mats replicate course conditions both visually and technically to ensure each practice stroke begins with a solid foundation. The lightweight Polypropylene maintains resilience during cold winters and hot summers. The durable materials also makes the Backyard Putting Greens Do It Yourself kit a viable addition to an office park as it can handle the extra traffic. Offer Employees a place for friendly competition to drive co-worker interaction. Whether for the workplace or the backyard, the acquisition of a premium synthetic turf putting green surface from Custom Turn Outlet brings access to the green all year round. This is a do it yourself kit, but each purchase comes with amazing support from a staff that has been in the artificial turf business for over 20 years. Never feel like our doing this alone, because we’re just a click or call away.